Calamari makes people management easier. It allows you to plan and track all types of vacation, time off and sick leave. Now you can track your attendance with ibeacons and mobile apps and automated notifications. Calamari supports companies with offices based in multiple countries/locations and supports role-based security. We are integrated with project management tools like JIRA, Slack, Office 365, Toggl, G Suite, Basecamp, Asana. Pros: I like that I don't have to think about it much, love the Slack integrations for my team and how easy it was to transition from our old process into Calamari. It's simple, clear, and for a small team it has everything I need. 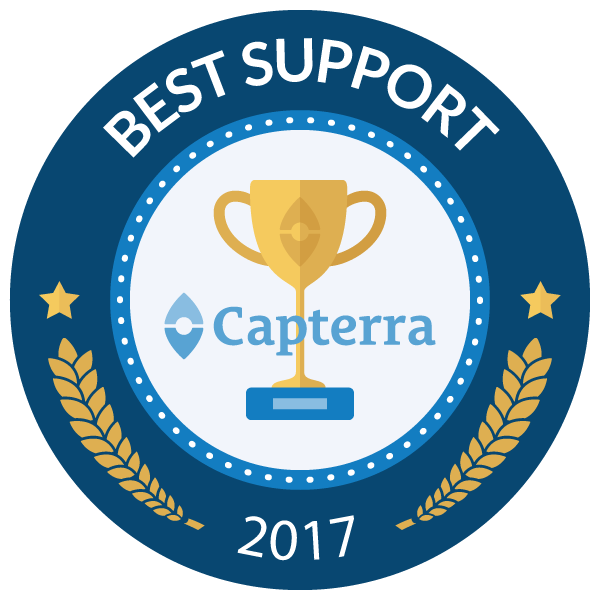 The customer support team has always responded promptly when I need anything, and we were even able to extend our trial period in the beginning and converted to a paying customer shortly after. Cons: So the most annoying thing, and this is a small issue, is not being able to select a range of dates on the calendar by clicking on the days themselves. Again, it's a small thing, but it's something I'm used to in other situations, and so I frequently make the mistake of forgetting it's not possible on Calamari. I suppose the other thing is that it's not always immediately clear how to make use of some of the finer features, and so I simply haven't been bothered to find out if they're even there. For example, I spent a little while searching once for whether we could only make it possible for employees to request annual leave in the future if they will have accrued it by the specified date (and not just if they have already accrued it, if that makes sense), but it wasn't obvious how to do so or even if it were possible, so I just kind of left it. These relatively minor complications are the kind of thing that someone in a rush will just leave in the moment, because they've more important things to do, but will be annoying over time. Pros: It's a new way of absence & leave management. You can plan and track all types of vacation, paid time off, sickness and you can do it without old, annoying paper forms. You'r always few mouse clicks from your dreamed vacations ;) Another wery importand feature is clock in/clock out - it's super easy to use especially with bluetooth beacons support. Place a token in your office reception and install/configure calamari app on our phone. That's all! You can forget about clockin in/out ever again. It will by done automaticaly when you enter/leave your offiice. If you don't want to use beacons or when you'r work from home you can still clock in/out "manual" from mobile app. It's worth to mention that calamari has super helpfull customer service. Cons: Beacon support for Android phone still need some fine-tunning compareing to iOS version. Except that - it's just perfect! Overall: Super easy leave management and clock in/clock out (using beacon). Pros: Manages employee hours, vacations, and sick days without a glitch. Also works great with iBeacon. I purchased and configured an iBeacon (https://www.amazon.com/gp/product/B019G0VS64/ref=ppx_yo_dt_b_asin_title_o06__o00_s00?ie=UTF8&psc=1), and configured it to work with the free Calamari app on each employees mobile. The result is that the software could keep track of every employee the second they walk in, and their last exit from the office every day. Cons: I have not really had anything that I didn't like. I had trouble deleting employees who left our company, but the support staff were very prompt, helpful, and friendly. Overall: We were looking for an HR solution for an SME, and we selected this one. We set it up a little over two years ago, and have not really had any glitches since. Once a year, we program the vacations for the whole year, and it does the rest. Employees request leave through the app as well. I highly recommend this software for companies of similar size. Camille, Thank you for the feedback! Effective timesheet and leave management - we have a very happy HR Department! Pros: We have decentralized operations, and our managers and HR love being able to see presence and location statuses of our employees in real time, and at a high level. The Calendar function in the leave module allows for great oversight and enables more efficient resource management and allocation. The time-sheet and leave reports available are robust and we love the download to excel feature, this perfect tabular format allows for deeper dives on trends, pivot tables etc within Excel. It really is simple to use for employees and managers. The app keeps things simple to enable clocking in/out and applying for leave. Really just very easy to navigate, after training our managers, no one has had to come back to us on how to navigate the system. There are several clock in methods which allows for flexibility, eg smartphone clock-in, QR scans, and browser check-ins. Cons: A few improvements could be made, such as allowing for attachment uploads from a smartphone for leave applications and for locations to be tagged when clocking in with a QR code. Overall: My review pretty much covers it. Resource planning in the Calendar view. Monitoring leave applications and clock in locations. My HR Managers now have confidence in the timesheet information as they can review it in real time and not just at month end. I really love integrations that Calamari provides me! At first: GSuite (by Google) - I do not have to worry about creating new accounts and I can see all of absences in my Google Calendar (this is my favorite) . Another huge integration is with Slack, which is main messenger in my company. I can just accept and decline requests without login in into Calamari! Once Calamari is configured is maintenance-free, and very very comfy! Comments: I do enjoy using Calamari. It is easy to learn how to navigate around the system and all employees know how to use it with ease. It is very self explanatory, pleasant layout and I can adjust employees holiday settings or absence requests very quickly. Support is excellent and always available for me to contact him. I like the calendar which gives a simple but quick overview of my company whereabouts. It doesn't take much admin time to set up a new employee or archive an employee. Pros: However, Kamil is a great help, very patient when I suddenly get called into a conference meeting and is always willing to support and understand your needs. Cons: The only down side is that it only has holiday and absence on there and nothing else. It would be brilliant if Calamari explored the market and expanded the systems functionalities such as adding a performance management section, recruitment section and incorporated all HR jobs into one system. Recommendations to other buyers: However, there is a lot of competition out there and HR seek management systems that can do everything in one place. Would suggest expanding what Calamari can really do and integrate with other systems such as Sage accounting software and Office 365. Simple, easy to use time management system! Pros: We love Calamari! From new users who find the interface very simple to use from administrators who can customize teams, approval flows, weekly schedules, accruing PTO, and reporting, Calamari does it all! There are always new updates which we are loving and find them super easy to implement and make our experience even better. Highly recommend this product! Cons: The only improvement that I would suggest would be to allow the employee list to be sorted by your preference. Such as the ability to put the last name first; Smith, John. Overall: Simple to use software to easily manage schedules, PTO, and accruals. Thanks, we really appreciate your feedback. Happy user is the greatest reward! Cons: Sometimes downloading reports at the end of the month is slow. Overall: We are using calamari for about a year and are happy for this switch to paperless mainly for the reasons mentioned in the Pros section and also to be able to have all data in one place. In overall, a great tool! Pros: Calamari is easy to implement, administrate and use. The customer support and the flexibility of the team is outstanding. The tools is feature rich but clean in design. New features and improvements are added on a regular basis and the roadmap is made transparent. Integrations to google, slack or other tools are in built. Customizing to specific needs is possible. Calamari increased management and transparency on absence/leaves significantly. Calamari is very easy to use, is transparent and our employees love this software. Pros: Transparency, choice between different groups and the approval flows. Easily adding new employees to the system and editing employee data. Easy transfer of data into excel tables. Modeling the types of absences is very easy and transparent. We like the quick response of the Calamari Group!! We recommend this software to all types of companies! Cons: The price could be slightly more optimal, otherwise it is OK. We would like to have a chance to insert collective holidays, to put all employees in the calendar at the same time. However, the Calamari group always helps. Thank you Anja for a great review! Pros: Calamari is an easy to use HR system, with easy and simple setup for any organisation. It convenient and easy to access as it is a web-based system. The system can cater for both local and international organisation with option to customize according to the country's holiday requirements. Cons: They still lack in their mobile application but they are improving with each update. They have bug fixes off and on but their customer service are swift to tackle the bugs in the software. Overall: Smoother HR in leave application and approval and also reduction of paperwork and head count in HR. Pros: The customer service is some of the best I've experienced. I took a video tour when I was considering the software, and the person who helped me with that was great, following up with me and going out of her way to make sure I had all the information I needed. The software is easy to use, and if you get stuck they are happy to help you out. They also do a lot of the setup for you, which is wonderful. The pricing is very reasonable, and the leave tool is more than we need for our small organization. Cons: The time tracking software didn't have all the features I was looking for at the time I was comparing tools, so I only chose to use Calamari for the time tracking tool. I want to reevaluate next year though, because they are adding more features and it'd be great to have everything all in one place. Overall: We were using a spreadsheet to track employee leave before we switched to Calamari - we're a small organization, so the spreadsheet worked for a time, but this was a huge upgrade. It has everything we need and more to keep track of leave. Very easy to use, and I love the incredible level of support they offer. Can't wait to check out the time tracking upgrades they are planning to roll out. Pros: 1) Pretty easy to figure out and set up in the Clock-in module. 2) Excellent support! For things that weren't so intuitive, the Calamari team was more than willing to assist. 3) Once I figured out how to set up our vacation accrual things were great! 4) Very accommodating in adapting the program to meet my needs. Cons: 1)	Tutorials and knowledgebase could have a few more examples of different scenarios that the administrator might encounter when setting up more complex leave policies. That being said, the Calamari team was more than willing to guide through anything I wasn't sure of. Calamari is user-friendly, intuitive and their support is incredible! Pros: A couple of features that really made a difference for us were the integrations with Google calendars and Slack. The reports available for managers and administrators have also been a big help for our team! Customer rep did an amazing job with setting up the account, and he really helped us customize items that were important to us. In addition, the Calamari team was able to build and change a few features that were essential to our team. It is clear to us that this platform is always evolving, and that Calamari is committed to delivering what customers need. We are very happy with what we have seen so far! Cons: The only thing we would really like to see is an integration with Google Team Calendars. We rely heavily on Slack to warn teams about absences, and unfortunately, this is not something that can be done via Calamari at this time. Overall: Calamari helped our team automate the PTO request and approval process, eliminating a lot of manual work. Thanks Tatiana for this stellar review:) and as you mentioned at Calamari we are committed to delivering what customers need. Pros: easy of use. Fast technical support if needed. Overall: I use calamari leave software since 2015. As IT company I was thinking of developing my own leave module to manage employee absences. But calamari came just in time and saved me money and stress of developing my own tool. Calamari has all I want and need from leave management system. It is easy to use and continously equiped with new features and enhancements. And their technical support is just great. I wish other software supliers were so fast. One remarkable example: I had an issue on 31st of December. A few hours before New Year's party. I have posted an issue to calamari team and even didn't expected to have any answer before 2nd or 3rd of January. But I got an anwer within 30 minutes!!! Just great! I really do recomend the software. Thanks Daniel! We are thrilled working with you, and other customers from Poland! Happy customers are the greatest reward! Pros: For our company i found Calamari a simple easy to use application to help track employee attendance. The application is simple to install and link with GSuite which is an asset for us without having employees go through a sign up process. Leave requests are to the point and being able to edit/remove/add erroneous entries is a big plus. Cons: My main issues is with the lack of flexibility regarding report exporting as the information is dumped into an excel sheet without having an option to include/exclude certain data. 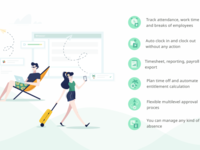 Furthermore, breaks should have the option to either include in the total hours worked or deducted automatically as it happens that employees forget to use the app when taking their breaks. Also its important that any administrator that does any changes to an entry should have their name indicated or logged as the modifier. Overall: Overall its been a pleasant experience and i know there is more room to grow such as the GPS tracker should apply to breaks and be able to click on the map rather than just a snapshot of the location. Winner for our business needs! Cons: I wish it could be a full service HR tool but I'm sure that is in the works. Overall: Our customer service rep has always been responsive, knowledgeable about the product and surprisingly and taken our suggestions into account. Modifications or enhancements to Calamari are timely and useful. Calamari makes it easy to approve and submit time off, and their reports are great! Pros: Calamari has integration with Slack, which was a big selling point for our team. Being able to submit requests, and approve/deny straight from Slack made the process so much simpler! Also, reporting was a feature that we used heavily as a company. Cons: We would love to have seen a team calendar integration with Google, instead of having to login to the platform. Our team relies on Google calendar very heavily for meeting scheduling purposes, and a team calendar integration would have been super helpful! Overall: The customer service at Calamari is top notch. They are fast in responding, efficient and very eager to help. They take suggestions to their product team, and during our time working with them we had one of our suggested features be incorporated into the platform. Their reporting capabilities are also incredibly useful, and interface is very intuitive and user-friendly. I highly recommend this software. Pros: Calamari makes the entire process of managing employee leave much easier from an admin perspective. We can now refer to our Calamari team calendar and know which team members will be out of the office and when. Calamari gives us a more formal method of managing leave. Where before, we would search through emails to find out when a request was submitted and who approved it, everything is now in one place. The feedback from our team has been overwhelmingly positive with many employees saying that it's so much easier for them as well! Cons: I have not found anything that I don't like about this software. Overall: We were finding that the administrative time required to track employee leave was becoming burdensome. So, we set out to search for a leave management system that would help us automate some of the processes and provide reporting as well. We are very happy with our transition over to Calamari. I have reached out to the support team with questions and always get a quick, friendly, helpful answer! Thank you Laura, it's a really valuable review. Keeping track of vacation is a real pain! Calamari has really helped us in this task. Pros: Calamari makes it very easy to keep track of vacation. They are very responsive to questions and are always updating the software. Cons: Setting up your initial vacation protocol for employees can be confusing but Calamari is helpful and will set it up for you if you tell them what you want it to do. A better virtual environment for attendance management. Pros: The application can be very useful for perfectly save everything. Calamari helps to manage staff attendance. Unique login credentials are used and access to the database is limited, therefore it helps to maintain an accurate record of the check in and check outs of the staff on each working day. It also has added features for keeping a track and record of the staff working hours. A further demarcation can be made to specify who was at which duty during which hour of the day. This can then be analyzed to make progress reports. Thus, It is an efficient tool for effective time management of the team. Cons: It becomes useful for the marketing teams of various departments but for small-scale businesses, the pricing might be a bit too much. The customer care and guidance are very limited. Pros: In general, the experience is high level, for a long time we were looking for a solution that will feets with our needs. Calamari team is always open for new solutions. Pros: Easy to navigate, easy to use for both management and employees. Cons: I remember I felt a little lost in the beginning, but just going through tutorials made a change and showed me how helpful Calamari is. Overall: I've been using Calamari for almost 1,5 year, and I had maybe two questions to customer care to ask (and they solve them in a few minutes). Perfect for our company (<20), we mostly use it for absence tracking. Thank you Paulina for a great review! Pros: I like that employees can simply clock in and out via slack or through the site. It allows them flexibility. Cons: What I like least is the fact that we cannot edit the timesheet report before it generates and select which categories we'd like to pull into the report. Example: Hours worked, Breaks, & Overtime only. I also do not like that we cannot tailor our overtime calculation to be over 40hrs in a workweek vs what we have not which is over 8hrs in a work day. Overall: Our experience has been great with Calamari and the customer support has been very efficient and helpful. Cons: - Layout of some areas like the calendar could be improved. - Phone app needs more functionalities. - Granular admin role required (currently either employee or full admin). Overall: We have implemented Calamari ~6 months ago and it allowed both employees and manager to track people leave a lot more easily than just using spreadsheet and accounting software which not everyone in the business has access too. We got rid of the leave forms thanks to Calamari and just that was a big win as it tracks everything and is still easy enough to manually override when required. The phone app showing your current entitlement is loved by our employees who used to never know how much leave they had available. It's also very easy to request and approve leaves thanks to it. However, more functionality on the phone would be welcome, especially for managers and admins. For the price point, we consider Calamari provides exactly what we need and has excellent customer service. Wonderful app! easy to use! very helpful! Cons: None, we are very happy with the product and has no complain. Keep working in that direction! Pros: Great UI, fabulous customer service, easy to use from a team setup and approval process, and it now include a lengthy list of 3rd party integrations such as O365 and JIRA etc. A must have in the workplace! Cons: There could be some better intergration with JIRA but there are multiple systems out there and it's hard to cater for all items. A public roadmap would be amazing! Pros: User interface design is a friendly. Easy create user by import from G-Suite account. Can be use on any devices and anywhere. Cons: we need more flexible generate reports and more detail on the report. the price a bit height for us. Need some variety such as reward for who 0 leave or reward system creative. Pros: The app and user dashboard is very user-friendly. Always listen to customer needs and put into action to support and fulfill such needs. Cons: Some incidents where user clock-out but the system didn't capture the records. This likely happens to our Android users only. Overall: We can easily track and see the attendance of staff. Pros: I like the simple and elegant UI, it integrated to Google Suite and Slack with ease. My colleagues giggled about the name and had no idea what I was talking about at first. The designers liked the logo. Awesome customer service! Cons: It doesn't seem to show true YTD absences, only all approved (which can be in the future). But they seem to constantly roll out updates, so I'm sure it will be possible in the next month or so. Overall: Visibility for managers to track time off. 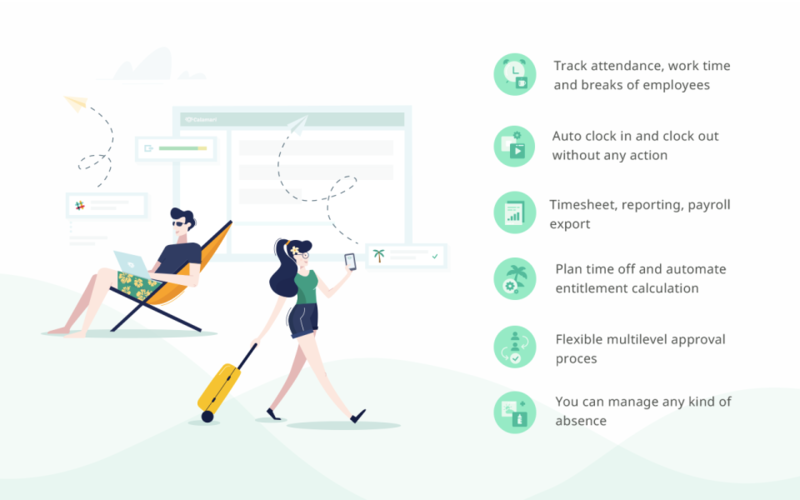 BEST choice for employee vacation tracking ! Pros: Great fully automated solution for simple employee vacation tracking & management. Saves me time so i don't have to worry about manually calculating holidays , accruals, and tracking employee vacation activity in a spreadsheet. Everything is calculated by the system and i get an email request when an employee wants time off. Perfect ! Employees appreciate the ability to check their own accruals and qwickly make a vacation request without completing forms. Simply click and submit. Employees like the Calamari mobile iphone application also. Cons: Setting up my companies vacation accrual formulas for different employees was a challenge, but Calamari Tech support was quick to respond with the solution and had me running the same day. Jeff, thanks for a great review. Cons: We are happy with the product, but it might be better if there were more useful reports and more detail on the report. Pros: Calamari is very useful and convenient system of registration working time. I love its way of applying for leave. I love how it is integrated with Slack and that it uses iBeacons for automatical logging worktime. Customer Support is quick and exact. I would love to use Calamari in our company (and I think soon we will - when it will fit all our needs). Cons: Calamari doesn't fit all our needs yet. For now, it doesn't have projects integrated with Jira Tempo and it can't export data to our account-HR system (Comarch OPTIMA). Thanks for the feedback! We're working on improvements on the Jira TEMPO integration recently. Pros: I like that this program works across multiple countries and allows you to customize so much. Not every feature that we need has been able to be accommodated, but the Customer Service team has gone ABOVE and beyond to help us get to where we need to be or make suggestions to get it close. Cons: Some functionality changes can take time, but that is a given. Overall: Wonderful! Our relationship with our representative, Ewelina, is beyond great! Very helpful in everyday work! Pros: The software is very easy to use. The layout is very readable. Calamari has managed to accumulate many functionalities needed by every employer. Support Calamari fulfills its duties sensational! Cons: Do not occur. Each problem was solved professionally and efficiently. Thanks for a feedback, actually we are working on new features and improvements every day :) :) Eg. attachments from the mobile app are available now. Pros: As an office assistant, I was also tasked to keep track of our team's presence for meetings, team building events, company assemblies, office seminars and other company official get-togethers. Calamari helped me track attendance and time in and out of everyone part of the team. I have also suggested this software to our HR officer for tracking leaves, absences and others. The software is easily learned and easy to navigate. Integrations are possible with some other software which makes it easier to monitor attendance. Cons: Not much to complain about at this point in time. Pros: Calamari is user friendly and has a very nicely designed interface. It has many features and you can easily tailor it to your needs. The team is always very responsive and willing to improve the program. Cons: I am still waiting for some small fine tuning but nothing to complain otherwise. Overall: Implementing Calamari in our organisation was the best decision. The approval process is much more efficient and colleagues love it. I honestly haven't had any problems with Calsmari. Easy to use. Very inexpensive. Pros: It's super easy to navigate. Foolproof. Simple. My rep is super helpful, friendly and patient. My employees love it. It's seriously as easy as clicking a button. Anyone can use this software. Cons: I wish there was a way to see more of the GPS feature. It's hard to know exactly where the clock in/out is because it only shows a small area. I also wish there were representatives in the US for quicker help. Simplicity, Best customer service, Great price/quality ratio. Pros: It's simplicity in combination with ensuring all user's needs. Cons: Its design could be better but this is a secondary matter. Overall: One and only app which have so fast and helpfull customer service. It's always on time and can implement any needed functionality almost immediately. Intuitive and effective, needs more flexibility. Pros: A great easy to use graphic interface. It requires very little preparation and users can start working on it almost rightaway. Cons: It still needs some improvement in the Leave module, especially concerning breaks and paid leave, which should have the ability to be left open and its duration defined by clockin and not in advance. Overall: Easy time management and control of presence/leave of employees, plus user satisfaction from the whole team. Pros: stable and work with no problems. Clock in on tablet is great option. Cons: not using friendly Evidence scrollbar to view time of working hours, specialy on mobile phone its not using easy. There is no app for boss to see hours - when i pay every day i would like to check in easy way who works for how many hours. i must log in by browser - its very hard to do. Overall: counting moth raports is okay, planing is okay. Pros: There are a lot of functions and some very useful features such as a "dropbox" styled space to share sensitive data with the Calamari team. Extremelly good Customer Support (actually probably the best I ever encountered). Had to contact them 3 times - all three times it was stress free, the team was helpful, had great understanding of the system and responded within minutes. Cons: Generally the software is close to perfect. There are a few functions missing which I might like, but each company has a different structure/needs. Overall: 70 employees. The old process - 1 decisive person, days/weeks for any response and approval and a ton of additional work. Paperwork. After implementation: Semi-automated process, multiple teams, everybody has access/knowledge about their teams. Thanks Ma¿gorzato for a great review, we really appreciate that! Pros: Simple to manage and maintain with good API's. It takes no time to manage once configured and users find it simple to request leave. Calamari is very intuicial and easy to use. Pros: Has integration with google calendar, what is very usefull for us. Great and flexible costumer service. The Calamari system is easy to use and navigate both for the employee and employer.